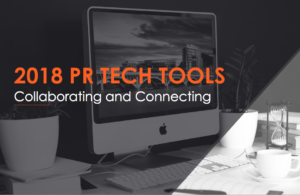 Each year at our annual meeting we present our favorite tech tools to our colleagues at PRConsultants Group, a consortium of senior PR professionals who represent the top U.S. media markets. They’re a very discerning audience, so we know that the apps we recommend need to be easy to use, practical and attractively priced. This year, it was all about tools that help us collaborate with co-workers and clients, and connect with the media and the world. Slack: Every team can use an app like Slack for project collaboration and management. It combines group and one-on-one communication, streamlines workflow, works with loads of other apps and has a searchable archive. There’s a free version, too. Trello: This project management tool looks like digital index cards or sticky notes arranged on a board. Adapted from the Kanban system of organizing workflow visually, this app works well for individuals as well as teams. Use as a weekly planner and even link up other apps to track project hours and log tasks. There’s a free version; teams can get it for about $10-$20 per user per month. Airtable: Think souped up Google spreadsheets meets Trello and you will have just a partial idea of what this app. This is sophisticated project management that features super-powered spreadsheets and CRM capabilities. It’s visually exciting, too. Choose from a wide range of templates to cover just about every personal or professional project or list. Get the Airtable free version to try it out; plans range from $10-$20 per user per month. NewsAI: Email programs are getting more targeted and this one caters to PR pros, who need to communicate with media efficiently. Build email lists of media complete with tags and social media links and develop emails that can be quickly and easily personalized. Track receipt of emails so you’ll know who might be interested. Great support and full disclosure: Curious and Clever offers a nice perk for new NewsAI customers. Prices range from $15.99/month for a personal account to $43.99/month (paid annually) for a business account. ANewstip: Instead of building a media list and hoping that journalists and influencers will be interested, find out who’s actually covering your subject, client or competitors. Use ANewstip to search keywords, companies and individuals for coverage on Twitter and in the news, build lists and email contacts directly from the app. Powerful and easy to use. Get Anewstip for free; Pro and Pro Plus versions cost $99/month-$213/month, with discounts for annual payment. Reportable: Create your own microsite to report the news in a visually interesting way, distribute your news via email, post to social media and track the results. Contact Reportable via email for pricing. Coverage Book: Create PR results reports painlessly, eliminating hours of copying and pasting. Add links to coverage and the app beautifully creates a report in minutes. Pricing ranges from $99/month to $499/month, depending on monthly coverage. Pitchengine: Stand out from the crowd with Newsboards; upload images and logos, create concise pitches and analyze the results. Pricing ranges from a free 14-day trial to $49/month for one brand to $149 for all products, unlimited users. Let us know what you think of these tools – or recommend others – in the comments!